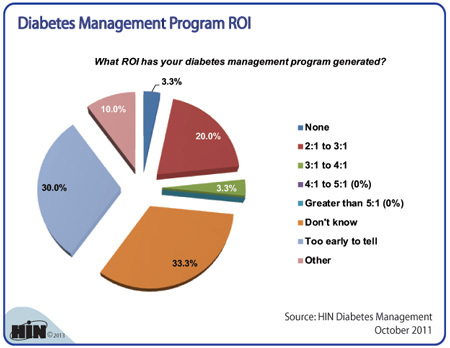 Healthcare Intelligence Network- Chart of the Week: What's the ROI from Diabetes Management Programs? New Chart: What's the ROI from Diabetes Management Programs? SUMMARY: Proper control of diabetes goes beyond prescribed pills and injections to encouraging individuals with diabetes to self-manage their condition, paying ongoing attention to weight, diet, glucose levels, blood pressure and other clinical metrics. We wanted to see the ROI generated by diabetes management programs. Download the executive summary of 2012 Benchmarks in Diabetes Management. 2012 Healthcare Benchmarks: Diabetes Management provides actionable data from 83 organizations on current diabetes management programs and their impact on population health outcomes and healthcare spend. 2012 Healthcare Benchmarks: Diabetes Management is available from the Healthcare Intelligence Network for $127 by visiting our Online Bookstore or by calling toll-free (888) 446-3530.